The “Parrots and Palms, Natural Heritage of Ecuador” campaign, raising awareness of the importance of wax palm for Parrots, began in March this year. The campaign is organised by World Land Trust’s Ecuadorian project partners Fundación Jocotoco, who are working with several different institutions, including the Ministry of the Environment to ensure the protection of four species of endemic parrots that rely on wax palms in which they make their nests. The campaign is aimed at increasing peoples awareness of the implications caused by the removal of wax palm, specifically palms from the Ceroxilon genus that are used on Palm Sunday. In recent years these palms have become particularly threatened by deforestation, especially in the north and south of Ecuador meaning loss of habitat for a wide range of species including the parrots which are the focus of the campaign. 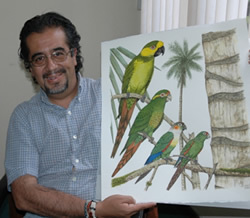 A poster produced especially for this campaign by ornithologist and artist Juan Manual Carrion, features the four species of endemic parrots that use these palms: Yellow-eared Parrot (Ognorhynchus icterotis) which is Critically Endangered, Golden-plumed Parakeet (Leptosittaca branickii) and White-breasted Parakeet (Pyrrhura albipectus) both listed as Vulnerable, and the Endangered El Oro Parakeet (Pyrrhura orcesi) which is the flagship species of Jocotoco’s Buenaventura Reserve. 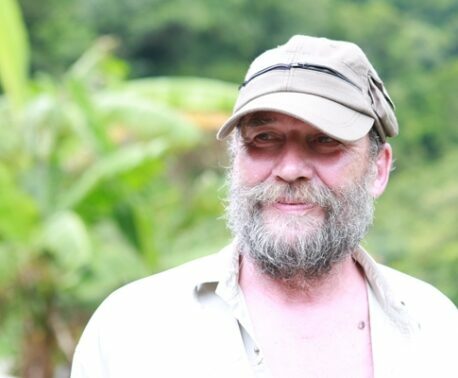 This year’s “Parrots and Palms, Natural Heritage of Ecuador” campaign was particularly successful in bringing greater awareness of the importance of wax palm habitats in Ecuador. It was featured on national TV and radio in Ecuador and campaigners were active in several different cities including Quito, Tena, Ambato and Loja. Wax palms are traditionally cut and used on Palm Sunday and it was particularly gratifying to receive confirmation that there was no destruction of wax palms within and around the WLT funded Tapichalaca Reserve. The success was largely as a result of the work of the University of Loja, and Tapichalaca reserve staff who have raised awareness of the importance of palm conservation amongst the local community as well as the Catholic Church. Future campaigns will continue to build on this awareness and highlight the important relationship between wax palm and parrot species.